I want to start by saying that of all the site builders out there, yola is by far the best one! 3. not that big of a deal but maybe an integrated gallery/slideshow feature. You could add your menu to the Tracking code box. Just a bit of tinkering needed. 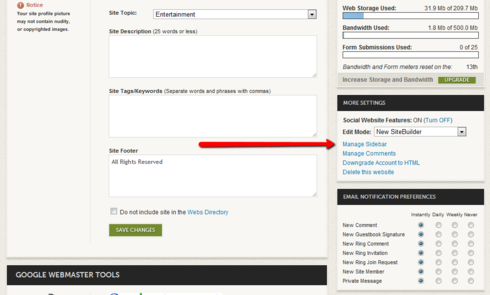 Thank you for your feedback on our Sitebuilder and for sharing feature ideas with us. We appreciate your input! 1. The sidebar feature for widgets you would like to use on each page is a really good one! I will be sure to pass the details on to our Product Team. 2. I understand that it's a nuisance having to edit your navigation each time and can see the benefits of having one place in which to edit it. It is possibly related to the first point and, if we do add this feature in the future, it will most likely happen at the same time. Will Andi's suggestion will work for you as a workaround? 3. The gallery widget is currently under consideration, so it may be something that we add in the future. Thanks again for adding your thoughts here. I am using a css menu. Are you needing assistance with trying to implement this? You should be able to add the codes using the HTML Widget. If you have to upload .js files then you will need to be a Yola Silver user to utilize this feature. Alternatively, you may want to consider upgrading to Yola Silver anyways as this does enable you to have the Submenu feature along with other goodies! For more information, please see: Yola Silver FAQs. Yes, if you could help in any way that would be greatly appreciated. If you can please try to do as much of it as you can and then email me at support@yola.com, ATTN: Sanja, I will be able to take a look at what you've done and assist further. Thanks for sharing your site, i've passed it along to Sanja and she will reply as soon as she comes online next! ewww that sidebar is so annoying, that's so wordpress, I love Yola just the way it is.